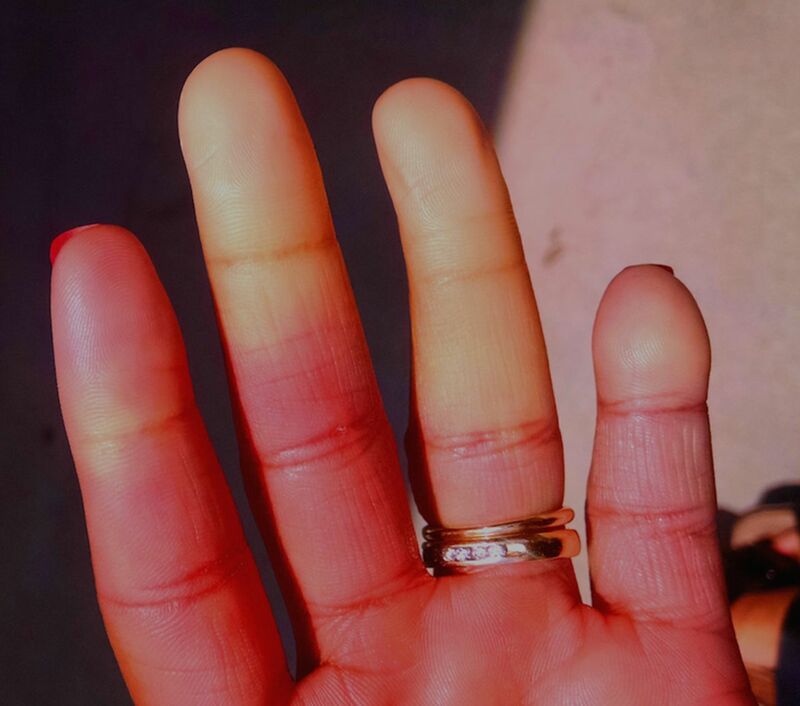 A 41-year-old African American woman with no significant medical history presented to clinic reporting of episodic finger numbness and colour changes. She described feeling as if her fingers were frostbitten and noted her second, third and fourth digits appeared white distally. She additionally reported of occasionally feeling food stuck in her throat after consuming solids. Physical examination revealed no joint abnormalities or evidence of skin tightening. Laboratories revealed a creatinine level of 0.95 mg/dL and trace proteinuria. An antinuclear antibody test was positive at 1:1200 and anticentromere antibody was also positive. The diagnosis of limited cutaneous systemic sclerosis (lcSSc) was performed on the basis of the patient's symptoms and aforementioned serology. Her dysphagia was concerning for oesophageal dysmotility and required gastroenterology follow-up. 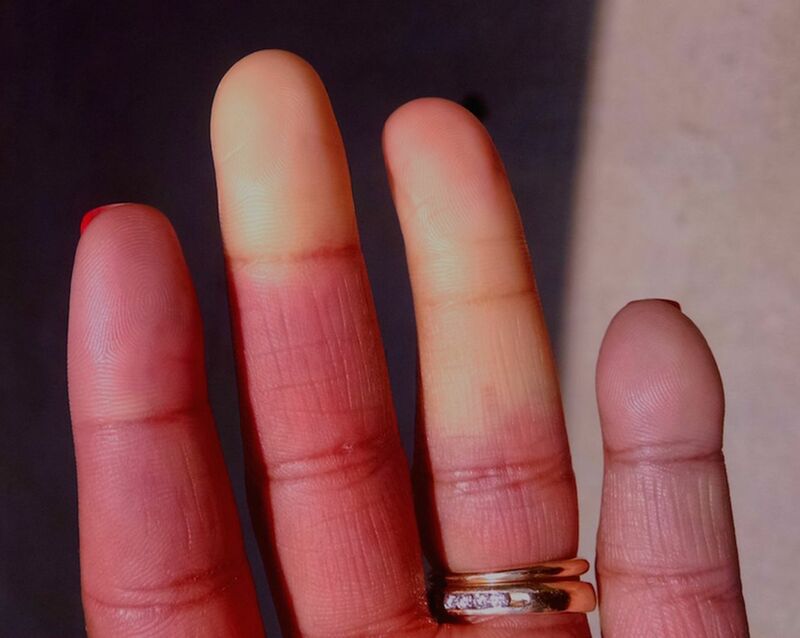 The above images highlight one of the patient's episodes of Raynaud's phenomenon (RP) (figures 1 and 2). The patient reported this as having occurred several times per week over the past 18 months and was unable to associate it with any precipitating or alleviating factors. The patient was scheduled to follow-up further with rheumatology for management and monitoring of lcSSc. Left hand during onset of Raynaud's phenomenon episode. Left hand 30 min into a Raynaud's phenomenon episode. Raynaud's phenomenon (RP) features a triphasic colour response as fingertips change colour in response to perfusion changes. Initial vasospasm results in pale white fingertips, followed by blue discolouration secondary to circulatory stasis, and, finally, red appearance in the setting of reperfusion. Work up should include thorough history-taking and screening for rheumatological disease. Nailfold capillaroscopy is an effective diagnostic method for differentiating primary from secondary RP, with secondary RP typically exhibiting capillary distortion and (or) loss. While primary RP occurs without associated disease and is classically a benign condition, secondary RP is associated with a wide variety of diseases including scleroderma, systemic lupus erythaematous and other autoimmune diseases, cryoglobulinaemia, hypothyroidism, sympathomimetic drug use and paraneoplastic syndrome. Current evidence most strongly supports calcium channel blockers, PDE-5 inhibitors, and prostacyclins such as beraprost sodium and iloprost, for symptomatic control of RP.